Trinidad Church Cuba by Maria Soto Robbins - 8.000" x 6.500"
Trinidad Church Cuba framed print by Maria Soto Robbins. Bring your print to life with hundreds of different frame and mat combinations. Our framed prints are assembled, packaged, and shipped by our expert framing staff and delivered "ready to hang" with pre-attached hanging wire, mounting hooks, and nails. Excellent artwork, beautiful light & colors ! Wonderful Coloring. Thanks for your comment on my art work Gandhi. Thank you, Nancy! I appreciate your kind comments! Hi Maria, welcome to FAA. It is nice to see other DPIAG members here. I love your paintings and thinks it's really neat that a lot of your paintings show how important your heritage is to you. I was asked, by a patron, to paint a famous tower from the city of Trinidad, Cuba. As I was doing my research, I discovered Trinidad to be a very picturesque colonial city about 200 miles from Havana. 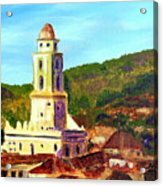 This scene shows the tower of the Iglesia Parroquial de la Sant�ma Trinidad which happens to be the largest church in the entire country, constructed in the 1800's. Trinidad in general, is dominated by moorish, neo-classical and baroque architecture. Trinidad, Cuba is a UNESCO World Heritage Site. 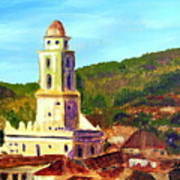 My impressionistic painting has gently textured impasto and shows the view of the tower with the surrounding rooftops.